It has been a while since I reviewed a burr made by Eric Fuller so I will redress that now! I bought the Packira back in November when Eric wrote that this was his favourite puzzle from the previous update. He looks at so many designs that I just had to take his opinion seriously! 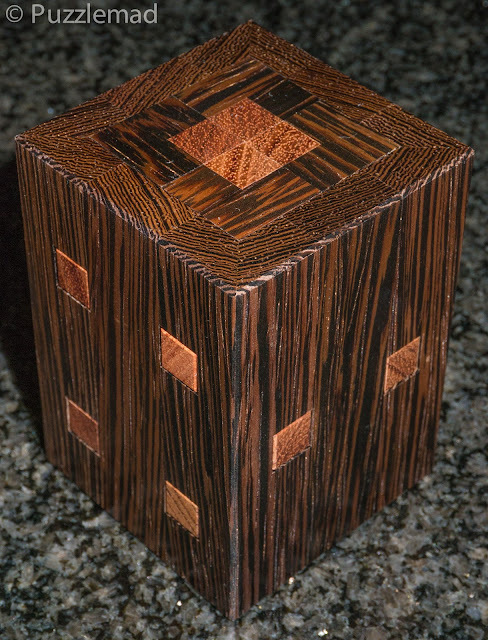 Plus of course, this is made from 2 of my favourite woods, Wenge and Bubinga. On top of all that it is designed by the amazing Tamás Vanyó! 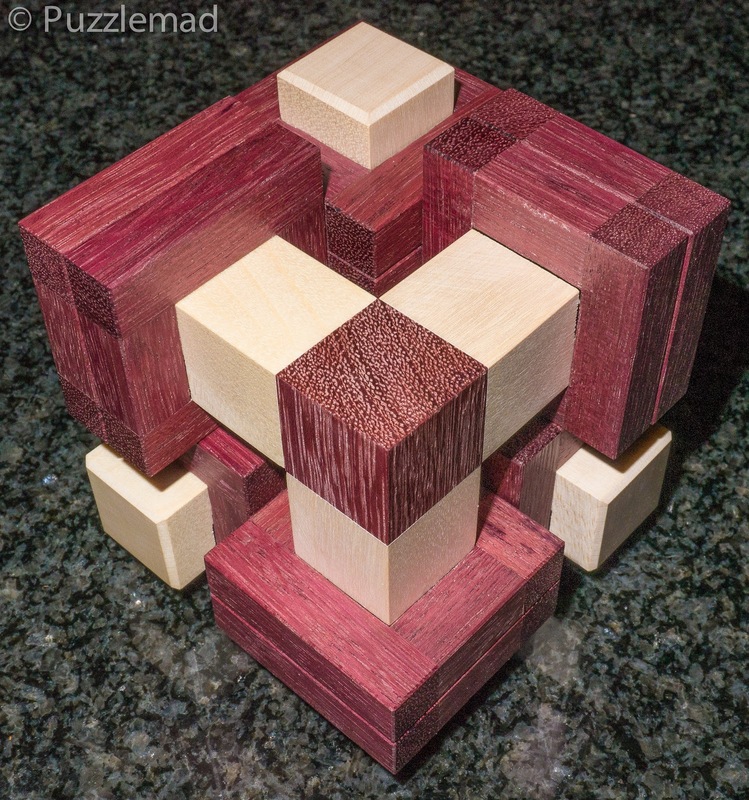 I have been friends with Tamás on Facebook for a few years now and every week he produces several new designs to amaze us - he is an absolute master of Burrtools and seems to specialise in unusual shapes or unusual movements in his puzzles. He even makes them himself for sale locally in Hungary or to give as gifts to his friends (one day I hope to buy directly from him). Recently I wrote about his Covalent puzzle which was produced by Pelikan which unfortunately is now sold out. The combination of Eric's workmanship and recommendation, Tamás' unusual design ideas and these lovely woods meant that I just couldn't resist this one. After it arrived, I got rather sidetracked by the other puzzle I bought at that time - the One Hole by Bram Cohen which I reviewed here. After that the Packira sat in my work bag for ages almost forgotten. Recently I was chatting with the genius that is Derek Bosch and he complained that he had been a little disappointed by the Packira because he had been able to simply shake the first piece out during his first exploration! I took mine out and explored a bit more (I had only had a very rudimentary look when it arrived) and that was definitely not possible on mine. I suspect that the difference in humidity between sunny California where D lives and grim, grey, wet Sheffield where I live makes all the difference. Whilst a few of the sliding cross pieces were able to move under gravity alone, most of them were a little stiff and needed pushing and pulling to move. In fact my only criticism of the design is that the sliders are so tiny that even my relatively small hands struggled despite using the tip of my pinkie to push them. This is a very unique and fun puzzle, and probably my favorite design of the update. 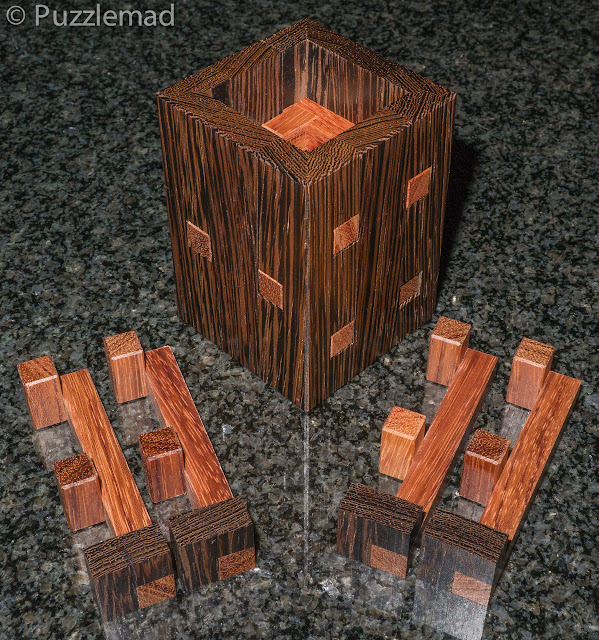 The box captures six sliders which move around to form an evolving maze for the four identical pieces to maneuver. Moderate in difficulty but over the top in enjoyment! If you haven't noticed I really liked this one, assembling them all was actually a pleasure. The construction of this puzzle is excellent, with a perfect fit and very labor intensive joinery and design. While fairly simple looking, it took ages to make and a lot of skill to get everything to line up correctly. 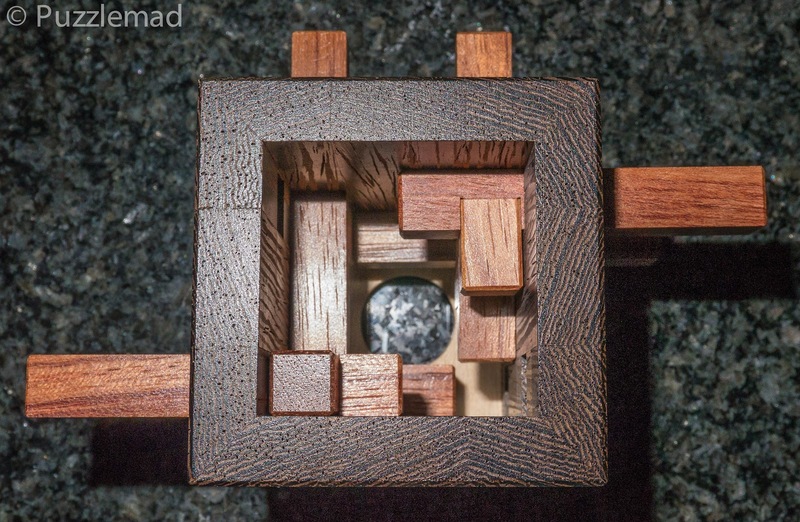 So this is a maze puzzle and not only that, it is a dynamic one. The sliding pieces all move about to allow the 4 central burr sticks to move about - they are actually captive in the frame. The general idea is to move them in such a way as to gradually form an open pathway and then slide the burr pieces out the top. There is a hole in the bottom of the puzzle to allow you to push the burrs upwards and also allows you to peek inside as you make room for pieces to move. Not only was I unable to repeat Derek's amazing feat, but I actually couldn't even find the first movement! I slid the sliders back and forth and couldn't get a single movement in a burr stick! I kept playing and then putting it back in my bag and in frustration allowed myself to get sidetracked by other arrivals. Eventually I decided that enough was enough and I needed to solve the bloody thing and write my review! I therefore spent some proper time on it and suddenly found the first move - I have no idea how I could have missed it as I must have been in that position many many times before. As always, I reveal that I am not very bright! Having moved the first piece just 2 units I got stuck again! Maybe I should give up on maze type puzzles? I fiddled for hours and hours and just couldn't do it! How on earth did D do it with just shaking movements? D sent me his Burrtools file and I filed it away in the hope that I wouldn't need it. One day I took it out of my bag and I noticed that the first stick was loose - why was that? Rather than take it out and carry on, I fiddled and reset the puzzle but now had a better idea of what was happening inside! This was a very clever idea - the sliders were more than just horizontal sticks and they interacted with each other in interesting ways! Now I understood the initial path and out came the first stick. Trying to remove the second proved a small challenge which I overcame in a further 5 minutes leaving the last 2. This would now be trivial, I thought and as usual I thought WRONG! My goodness! That took me a hell of a long time! 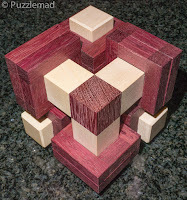 I love this puzzle or the look as well as the very high difficulty level. My colleagues at work definitely thought I was less of a genius as I struggled with this in front of them one lunchtime at work! My orthopaedic colleague felt so sorry for me that he offered to get a hammer from his hip replacement kit to solve it quickly. Luckily I hid it before he had a chance! NEVER trust an orthopaedic surgeon with anything delicate as their solution is to hit it with a hammer and if that fails they just get a bigger hammer! Ouch! Amazing puzzle Kevin. I still can't get the last 2 pieces out! OMG! You did it again! It's Not So Hard! Just Look and Think!